A three storey building with a structural concrete frame and cantilevered elevations of stone and glazed panels with interesting elevations that can be viewed from all sides so that in effect the library has no back. 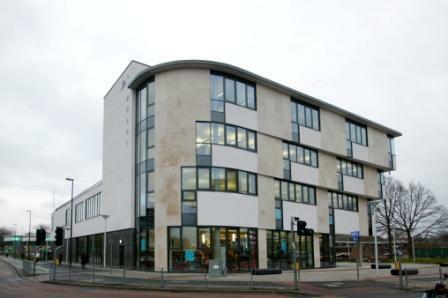 The library occupies 3 floors and the building is shared with the Registrar Office and also has a floor of office accommodation. The Library is arranged around an atrium that turns round on itself with a feature 'ribbon' oak staircase that connects all library areas. 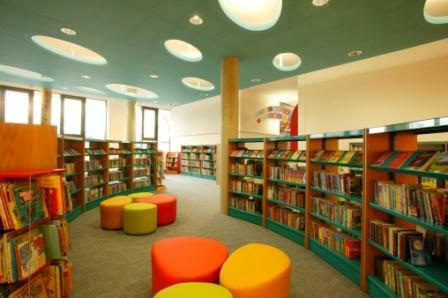 Brightly coloured acoustic canopies define the enquiry desks on each floor. Art by artist Gordon Young features 14 untreated oak trees placed around the library etched and sandblasted with quotes from favourite books using a variety of typographies to suit the content and type of quotation. Mixed mode heating and ventilation system with electrically operated windows to provide natural ventilation. Pre- heated air is circulated through the floor voids and extracted via the atrium. A wind trough at the head of the atrium draws air upwards during hot weather boosting the natural ventilation rate. Floor plates are cantilevered to provide shading during summer months whilst allowing daylight in. Solar water heater and Bio mass boiler. There is an exhibition room that can seat 60 people, a meetings facility with a kitchen area and an IT suite with 12 pc's.